For over 30 years, North Georgia Brick has partnered with top brick manufacturers to build the finest residential, multi-family, and commercial projects in the Southeastern United States. Widely recognized as the leading brick distributor in the nation, North Georgia Brick proudly offers the most diverse selection of the highest quality products. With access to more Brick Manufacturers' product offerings than our competition, the color and texture combinations are almost endless. Our company employs a large, professional sales team ready to assist with your project and support you with an unmatched commitment to service designed to handle today's challenging climate. Every day our organization seeks to provide the best possible experience for our customers as they trust NGB as their building partner. 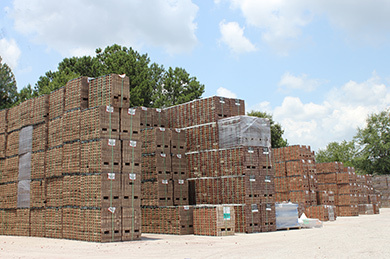 As NGB approaches its 25th anniversary, it has become known as one of the leading brick distributors in the United States from its primary service area of Metropolitan Atlanta, Georgia. From its core of 3 distribution locations, NGB employs one of the largest professional sales organizations with a goal to meet and exceed the needs of its broad customer base in residential, multi-family, and commercial markets. NGB's long time sales force possesses superior knowledge in all aspects of the brick and masonry industry and is able to offer superior service through prompt deliveries using its large fleet and numerous distribution sites.